The largest head is a portion of a larger sculpture that blew apart in the wood-fired kiln of my favorite pottery studio. The tall sculpture and plate are also by the same artists. The bowls are pre columbian, The glazed vase in back contemporary Colombian. 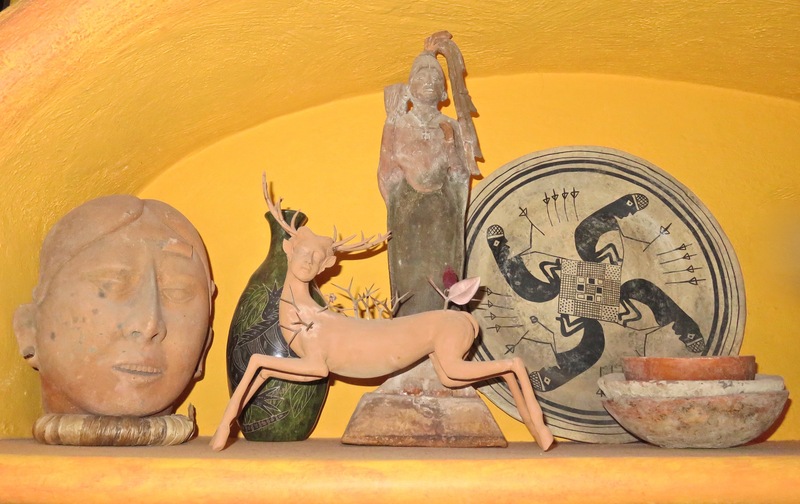 The Frida/doe sculpture in front is a piece I bought unpainted from a Michoacan artist. I added the thorns. Its fragile antlers and legs have been broken off so many times as Yolanda dusted them that after my last repair job, I finally put it up too high for her to reach. 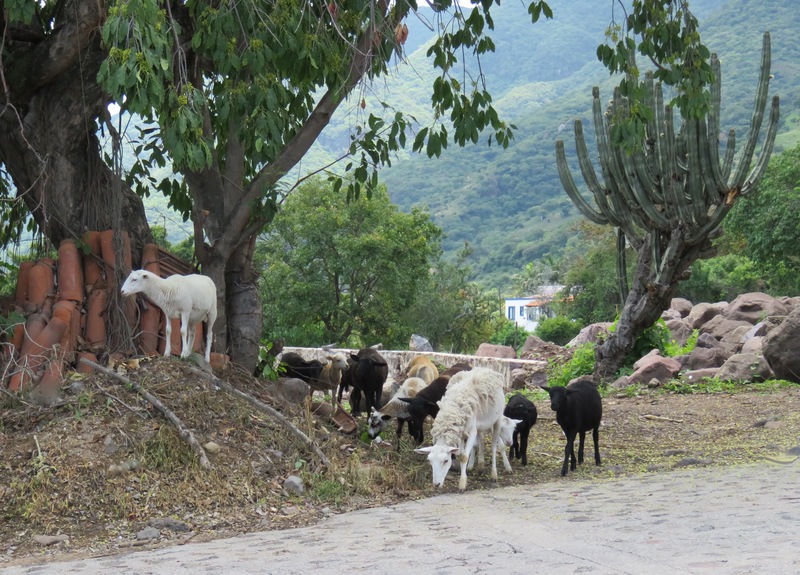 As I pulled into the upwardly inclined cobblestone road that leads up to my house, this herd of sheep came charging across the road. Luckily, my camera was close at hand. They streamed onto a vacant lot and as the rest grazed, one with illusions of grandeur sought out the highest hillock to become king of his own small mount. This entry was posted in Cee's Fun Photo Challenge, Sheep and tagged Cee's Fun Photo Challenge, image of sheep, Images of Sculpture, Sculpture, sheep on July 7, 2015 by lifelessons. Your writings are always inspiring and thought provoking…thanks.. Thanks, Peggy. Your posts on Facebook always make me feel so sedentary!!! All those expeditions on horseback. Thanks, Julie. I loved seeing them crossing the road and then settling! Beautiful pieces, and the photo looks like a painted scenery. Great! I really like your choices of photos for this week’s 5 items. Thanks for playing Judy. Love the sheep, Judy. the one on the left looks a bit mischievous! The king of the mountain, you mean? Yes, he does! !